I was perusing through one of my favorite inspiration blogs, Hostess With The Mostess, when I came across this awesome DIY project! 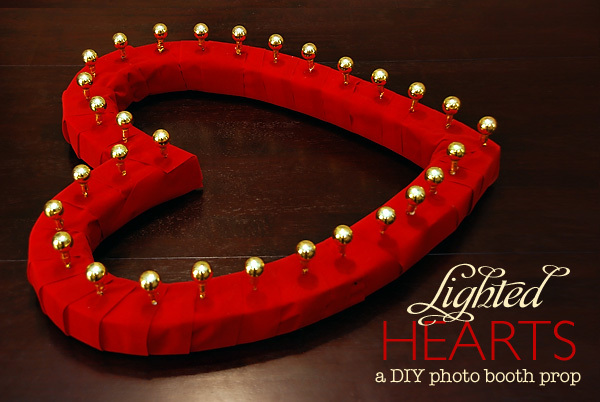 These hearts would not only be SOOOO cute as a photobooth prop, which is how HWTM suggests you use it, but they would also make an adorable prop for an engagement session or for the wedding day during the Bride & Groom Romantic Portraits session! The project is pretty easy to do and the adorable-ness would pay off ten-fold! LOVE! Ooooh you could also makes some “X’s” and “O’s” to match… that’d be SUPER CUTE TOO!